This book shows you how to perform amazing close-up tricks, baffling optical illusions and incredible mental magic. 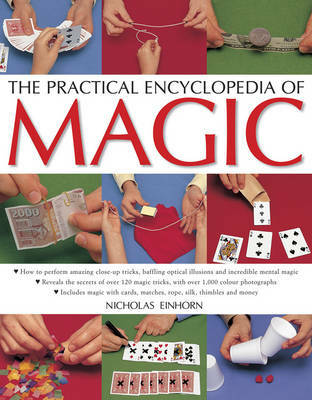 It reveals the secrets of over 120 magic tricks, with over 1000 photographs. A wide variety of tricks are covered, including magic with cards, matches, rope, silk, thimbles and money. It includes an illustrated history of magic and magicians, from the origins of the art in Egypt through to the magic of today, featuring magicians such as Siegfried and Roy, David Copperfield and David Blaine. Magic is universally recognized as a wonderful form of entertainment. This book reveals the secrets of a wide range of tricks and explains how to achieve a polished performance. It explains how to grip, shuffle and control cards, do tricks with glasses, napkins, cutlery, straws, cups, sugar cubes, matches, string and rope, and how to create the impression of mind-reading and thought transference. Once you have learnt the basic techniques, there are also many tricks to perform with coins and banknotes. With over 120 incredible magic tricks and more than 1000 step-by-step photographs, this book will enable you to amaze your friends and family.